You’re dreaming about a full-fledged home library, but it’s pretty hard to find an individual room for this purpose in your house? There is just one way out – multifunctional spaces. 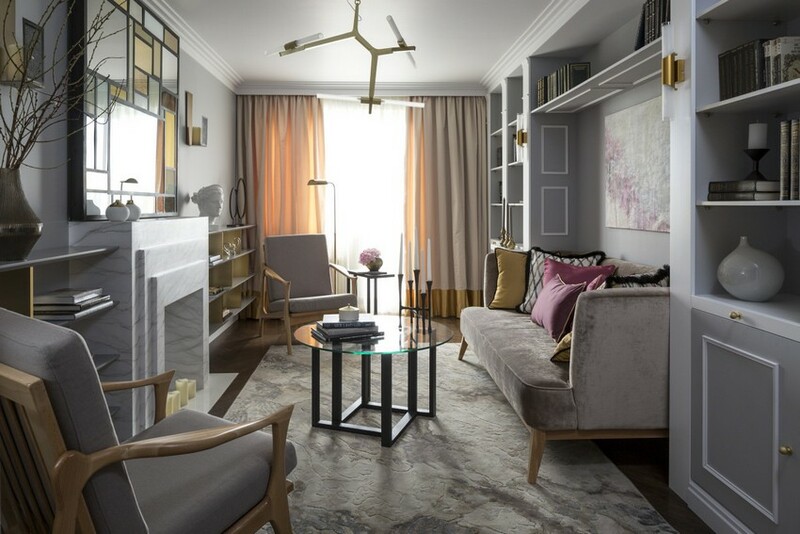 Today we’ll show you a real life example of a stylish reading hall arranged in a small narrow living room, which also features a full set of sitting furniture, a fireplace, modern artworks and technical appliances. This living room was designed for a very well-educated family couple who work as editors in a history magazine. The first thing that caught the eyes of the designer during the first meeting was an enormous quantity of books, which literally occupied the entire living space. In the course of the conversation she realized that these books are a life passion. That’s why it was decided to arrange a living room as a lounge zone including a home library – a multifunctional space for reading, relaxing and talking. The centerpiece of the room is a bespoke faux fireplace. 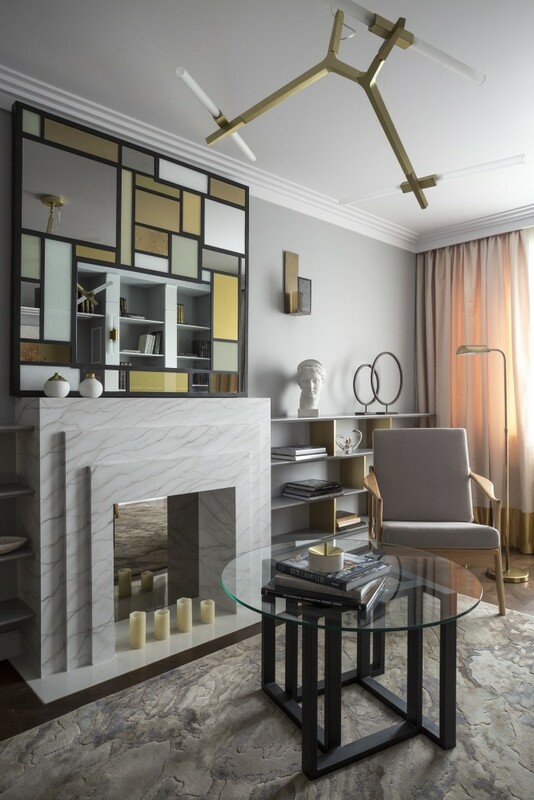 Arranged above it is a marvelous geometrical mirror wall décor in art-deco style. 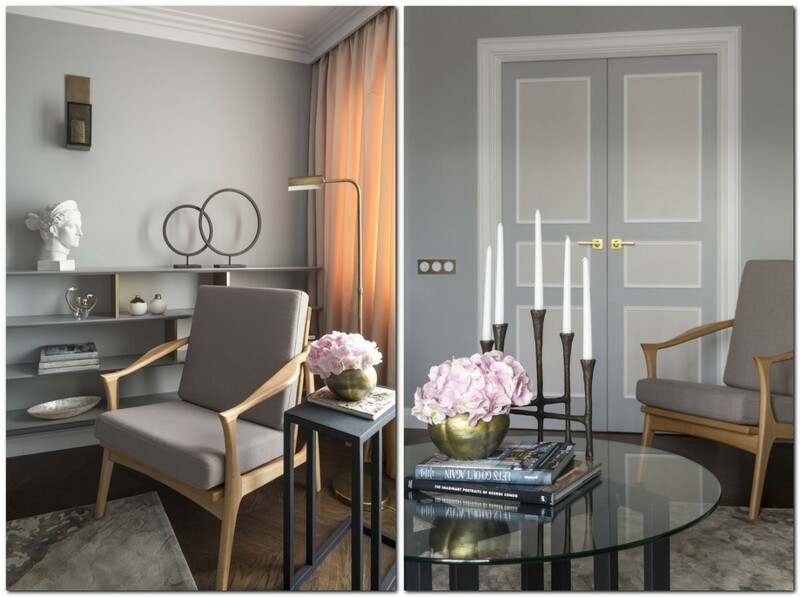 It plays three important roles: firstly, it expands a narrow room visually; secondly, it’s a vital element of décor setting the mood; and thirdly, there is an incorporated TV-set in it, which is absolutely invisible when switched off. Primary interior colors are soft, mostly grayish, neutral and comfortable for the eyes. 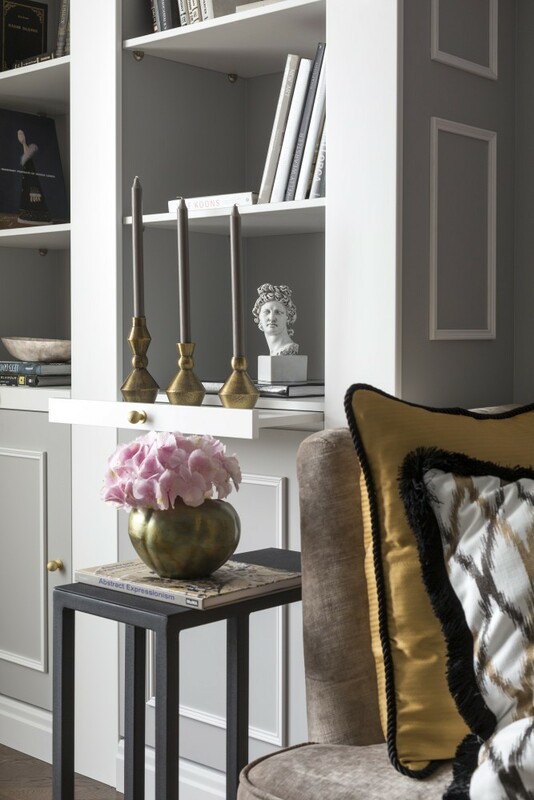 And when coupled with brass, gray looks especially noble. 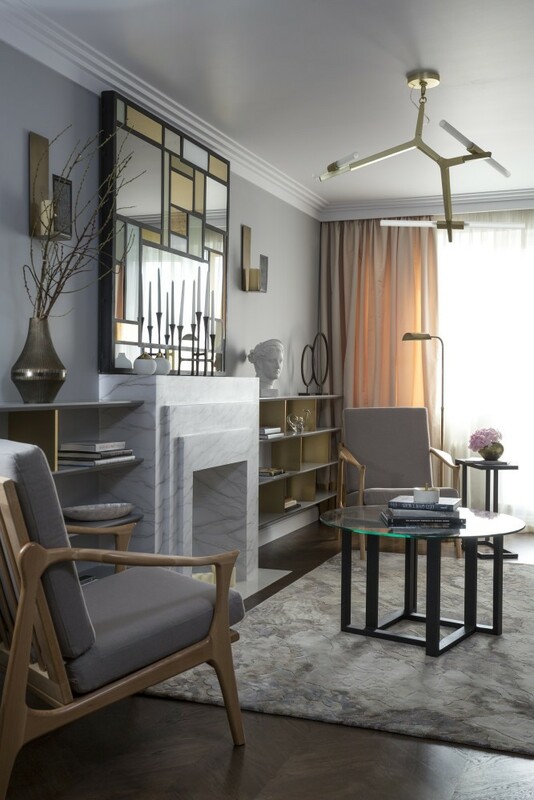 Geometrical wall décor, a clear-shaped coffee table framework, and brass insertions – these are all elements of art-deco style. These active details look pretty original, but it’s vital to remember the sense of proportion. Hence they are somewhat balanced and softened by laconic shapes of Scandinavian furniture. 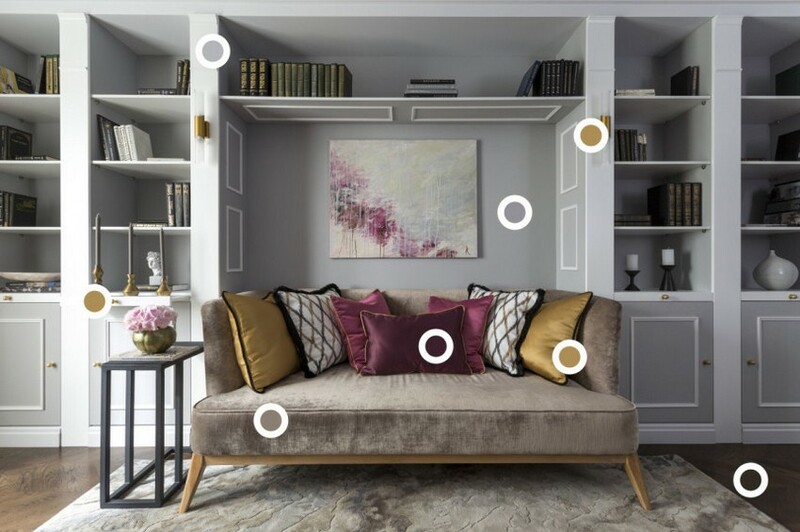 So that you had a clearer idea of the color scheme of the room, there is an image indicating the entire range of hues used in this interior. Home textile is also neutral and natural. The sofa upholstery is cozy velvet, which adds more comfort to the lounge zone. The giant shelving unit has a pretty classical design and combines open storage with cabinets. Thus, the architectural image of the space appears to be clear and graphic, generally monochrome, but including bright contrasting accents. 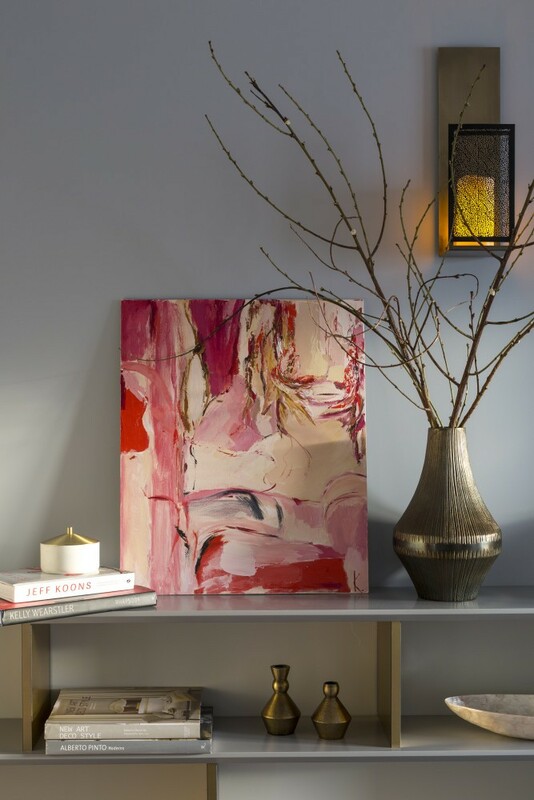 Interiors created by professional designers are usually recognizable by the presence of elements, which link all the elements of the room together. In this lounge this role is played by an artwork that has been custom-made for this very room. Including the entire color palette present in the interior, it brings a finishing touch to it. Herringbone pattern of parquetry and peculiar composition of door faces remind of something French-style – noble, exquisite, and eclectic on the other hand. In home libraries a thing that deserves a special mention is well-thought-out lighting. Here the room is fulfilled with versatile lighting sources: a chandelier, wall lamps, a recessed LED strip in the sofa area giving soft diffused light, and incorporated illumination of the mirror wall composition above the fireplace. The latter offers a few lighting scenarios with different light color temperature and intensity, as well remote control of these options. Also the wall décor is framed by a couple of decorative wall candle lamps that bring a note of warmth and romance to the lounge atmosphere.